Oliver Hill, 81, grew up in segregated San Antonio. He graduated in 1952 from the all-black Phillis Wheatley High School, named for the famous poet who was brought to America as a slave. When Robert E. Lee High School opened across town in 1958 honoring the Confederate general, Hill viewed the name as a deliberate reminder to black San Antonians that the city did not belong to them. So last year, when the North East ISD board of trustees considered changing the name of Robert E. Lee High School, it seemed to Hill like an opportunity to right an old injustice. He delivered a speech at the board's August meeting urging the change. In December, after months of public comments and debate, the board voted 5-2 to keep the school’s name the same. "They haven’t walked in my shoes," Hill said of those who wanted to keep Lee's name. "They don’t understand what I go through when I walk past those things." North East ISD’s debate was one of several explosive deliberations about the names of Confederates on public schools that unfolded across Texas during the last academic year, in the wake of the massacre in Charleston of nine African-American worshippers by a man who revered the Confederacy. When classes start later this month across Texas, 10 schools in Austin, Dallas and Houston will welcome students to the new academic year with new names, leaving at least 24 that still bear the names of Confederates. Of 20 school districts where The Texas Tribune has confirmed there is at least one school named for a Confederate leader, the North East ISD board is the only one that has formally considered a name change and voted against it, according to spokespeople for the districts. Though the particulars differ, the fundamental issues at stake in each community are the same. How should we evaluate historical figures? Who is entitled to make those evaluations? Where is the line between remembering and commemorating? Can society repudiate the Confederacy but still decorate public spaces with allusions to its heroes? And in every case, battles over school name changes have been fraught and emotional, sometimes leading to allegations on both sides of bullying, rescinded birthday party invitations and grocery store parking lot confrontations. Efforts to rename schools that pay homage to Confederates have made headlines across the country. Public symbols of veneration for the Confederacy have also been reconsidered at UT-Austin, which removed of a statue of Jefferson Davis last August, and House Speaker Joe Straus charged the Texas House Administration Committee with reviewing Confederate statues on the Capitol grounds. But in the vast majority of Texas school districts with at least one school named for a Confederate, no one has formally raised the issue of renaming. Last summer, The Tribune identified 29 schools named for Lee, Confederate President Jefferson Davis, Gen. Thomas Jonathan "Stonewall" Jackson and Gen. Albert Sidney Johnston. The list did not include Confederates such as John H. Reagan, the Confederacy's postmaster general, General John B. Hood, or Maj. Richard Dowling, all of whom had at least one school named for them in Texas. Of the 29 schools on the Tribune list, five have been changed; five that were not on the list have also been changed. From Eagle Pass ISD along the border with Mexico, where 100 percent of students at Robert E. Lee Elementary are non-white, to Amarillo ISD in the panhandle, Confederate names still sprawl across school walls and letterhead. The name change decision involving the largest number of schools came in Houston, where the school board voted this spring to change the names of eight schools. Supporters applauded the board’s decisive action; detractors lamented the lack of community input and argued that the board’s decision created a false equivalence between figures like Lee and Davis, and Sidney Lanier, a Georgian best known for his literary work after he served in the Confederate army. The rancor culminated in a lawsuit against the board this summer, charging that the board did not follow proper procedure and failed to inform the community about the cost of the action. Adrienne Murry, a Bob Lanier Middle School (formerly Sidney Lanier Middle School) parent who is a plaintiff in the lawsuit against HISD, said the board disregarded the wishes of students, parents and alumni who wanted to keep the school names the same. Lanier's new name honors a former Houston mayor. Rhonda Skillern-Jones, a board member who championed the name changes, is not persuaded by arguments that Lanier’s Confederate service was an insignificant part of his life. Murry’s lawsuit is seeking an injunction to forestall the name changes and force the board to redo the process. After the HISD board approved $1.2 million at its meeting last week to pay for the renamings, interim superintendent Ken Huewitt said the funding decision addressed the concerns raised in the lawsuit. A ruling in the suit is expected sometime in the next month, according to Murry and Arturo Michel, a lawyer representing HISD in the suit. In Austin and Dallas, school boards voted to rename a single school each — Dallas’ John B. Hood Middle School became Piedmont Global Academy, and Austin’s Robert E. Lee Elementary became Russell Lee Elementary — and only after the school communities had debated the issue and asked the board to act. In Dallas, students at John B. Hood Middle School held a vote to get rid of the name. Then they held another vote to pick the new name, Piedmont Global Academy. The board of trustees approved their decision. In Austin, parents in the city’s Hyde Park neighborhood held numerous meetings to discuss changing the name and fought for the board to vote for a new name: Russell Lee, in honor of the documentary photographer who recorded life during the Great Depression and lived in Austin for decades. According to parents on both sides of the issue, the yearlong process quickly turned tense. “White-hot” and “rough” are the adjectives Laurie Marchant, a Lee Elementary alumna who attended the school in the late 1970s and early 80s, and parent of a current Lee student, chose. Marchant supported the name change. “Ugly” and “uncomfortable” are how Caroline Roberts, a former Lee parent who helped author a petition seeking to designate the school, built in 1939, as a historical landmark, remembers the meetings about the name change. People who felt like she did— that Lee was a "respectable man" and changing the school's name would be an attempt to erase the past— were "blacklisted." Roberts says she was called names and confronted by other Lee parents in public. She has decided to withdraw her twin 8-year-old sons from AISD and homeschool them instead. At Lee, the renaming issue also brought in Austinites who had no connection to the school. Robert Reed, a fitness instructor, learned that the topic would be discussed at a March board meeting from one of his clients, a parent at Lee, where the majority of students are white. Reed was one of the only African-Americans to speak at the meeting. The school-by-school approach there and in Dallas has created inconsistencies. Austin has stripped “Robert E.” from its school list, but it has no formal plans at the moment to rename Lanier or Reagan High Schools. 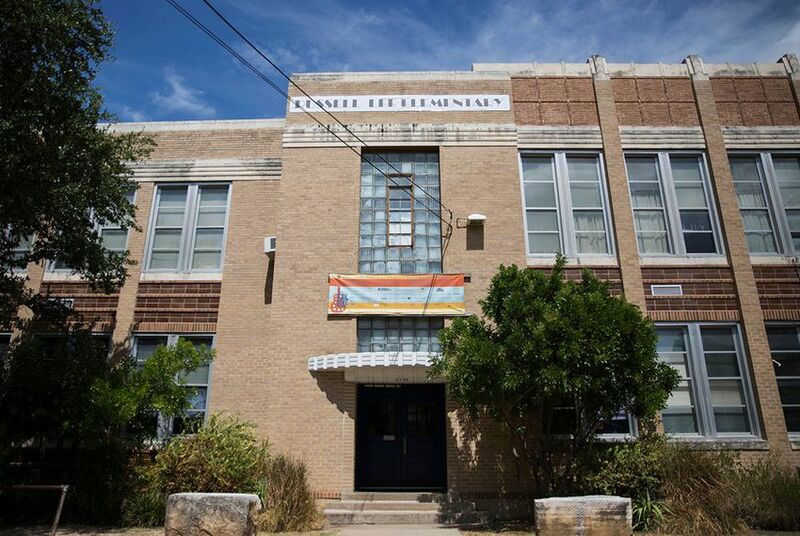 Dallas has scrubbed off the name of Hood, but the board has not formally considered renaming Robert E. Lee, Stonewall Jackson, or Albert Sidney Johnston Elementary Schools, according to district spokesman Andre Riley. Lew Blackburn, president of the Dallas board of trustees, said most parents and students don’t think much about their school’s name. To Jacqueline Jones, chair of the history department at UT-Austin, and a specialist in the Civil War, race and slavery, there's a simple answer to the question Blackburn has heard: "Symbols matter." "Of all the really sterling, inspirational figures of American history, to have to say this building is named for someone who took up arms against the U.S. and also fought so that other people would be held as slaves," Jones said, "What kind of message does that send?" She acknowledged that there are cases that raise challenging questions: people like Sidney Lanier, for example. That's why debates about venerated historical figures are valuable, she said — and why it is disappointing that many districts have not had any discussion of the issue. That might be because the war's most famous events took place far from Texas, so its legacy could feel less immediate to some Texans, Jones said. Bob Geske, a member of the El Paso ISD board of trustees, said he thinks his community's orientation toward the border and the Southwest, rather than the Southeast, could be one reason no one has called to rename the district's Robert E. Lee Elementary. "El Paso is 86 percent Hispanic," Geske said. "This is our heritage, not the Civil War. Maybe it is the lithium in the water, our geography, or just plain ambivalence, but that war is very seldom discussed." To Jones, it's only a matter of time before people call for other schools named for Confederates to change.